Imagine turning up to work only to find your tools missing, your desk gone, or your computer disappeared. That is what happened to SC Braga's players before their Europa League match with Marseille on Thursday. When they arrived at the French club's ground, the boots they had left there the night before were nowhere to be seen. Reports in Portugal suggested they had been stolen on Wednesday, and concerns were raised over Braga potentially not being able to fulfil the fixture. Sponsorship deals mean many players are contractually bound to wear certain brands of boot, and it was unclear as to whether replacements could be sent on time. 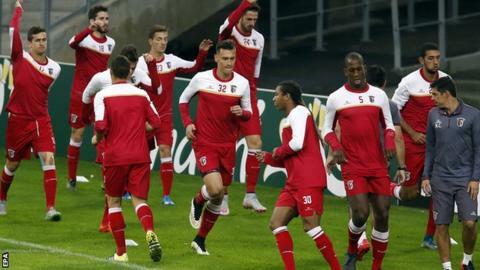 Whatever the circumstances behind the mysterious disappearance, the Braga players certainly had studs on when they were warming up on the Stade Velodrome turf before kick-off. "For those of you asking, yes the Braga players are wearing boots on their feet," Marseille posted through their Twitter account in the build-up to the 18:00 GMT kick-off. But what if there were lucky pairs among those that went missing?